(b) Calculate the velocity with which the proton enters the magnetic field. (c) Calculate the magnetic flux density needed to bring the proton exactly at the detector at the point (0, – 8.35 cm, 0). (d) The magnetic field is gradually decreased from the value asked for in part (c). Calculate the value of the magnetic field which will allow the proton to just cross the magnetic field. (a) The magnetic field is to be applied along the positive Z-direction. [Option (iii)]. At the moment the proton enters the magnetic field, its velocity is along the positive X-direction. The magnetic force on the electron at that moment should be downwards (along the negative Y-direction) so that it suffers a negative Y-displacement by the time it reaches the detector. By Fleming’s left hand rule (motor rule), this can be achieved only if the magnetic field is directed along the positive Z-direction. qEd= ½ mv2 where m is the mass of the proton and v is its velocity. Or, v = √[(2×1.6×10–19×900×8.35×10–2) /(1.67×10–27)] = 1.2×105 ms–1, directed along the positive X-direction. qvB = mv2/r where B is the magnetic flux density. As the proton has to reach the detector at the point (0, – 8.35 cm, 0), the diameter of its semicircular path (as demanded by geometry) in the magnetic field is 8.35 cm so that the radius of the path is r = 4.175 cm. Therefore, B = (1.67×10–27×1.2×105)/(1.6×10–19×4.175×10–2) = 3×10–2 tesla. 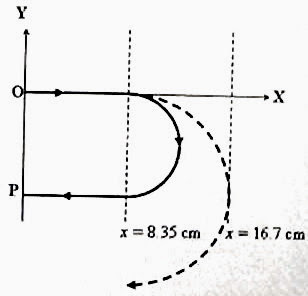 (d) If the magnetic field is decreased from the above value, the radius of its path is increased. The limiting value of the magnetic field upto which the proton is prevented from crossing the field is that which will make the radius of the path equal to the extent of the magnetic field (r = 8.35 cm). The path of the proton in this case is indicated by the dotted semicircle in the figure. The value of B1 is half the value obtained in part (c) since the radius is doubled. Therefore B1 = 1.5×10–2 tesla.